With 50 new transmutation spells detailed in Starlanko's inimitable style, who could miss this? Publisher's blurb: "Do you like things? Yes, of course you do. But you know you like some things more than other things. You like chocolate ice cream more than tasteless gruel. You like staffs more than double sides axes. You like cute kittens more than evil blackguards. Don't you wish there was a way you could turn some things into other things? 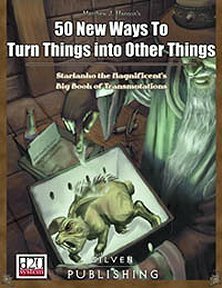 "Now you can, with 50 New Ways to Turn Things into Other Things: Starlanko the Magnificent's Big Book of Transmutations. This new book features 50 new spells from the transmutation school, each featuring the history of the spell and tactics for optimizing its use. Each spell is chosen because it offers something new to the wizard's (or sorcerer's) repertoire, some tailored to the wizard warrior, some allowing wizards to strengthen their friends, and some designed for pure offense. From the zero level iounic transportation to the ninth level nigh indestructible, 50 New Ways to Turn Things into Other Things offers something for everyone*." *Except for barbarian, fighters, monks, paladins, rangers, rogues, NPC classes, and other classes not found in the player's handbook.